← May 2014 – Zoom with your feet??? Fortunately for me I wasn’t “THE” photographer. I actually had a lot of fun once I got into it. I found myself inspired even. I know that the idea of my blog was to share the whole brutal process of selecting a frame and talking about post processing, but life has been far to demanding lately for that. My apologies. When you take a good photograph post processing becomes easy. I cropped I converted to B and W and I added a bit of vignette. 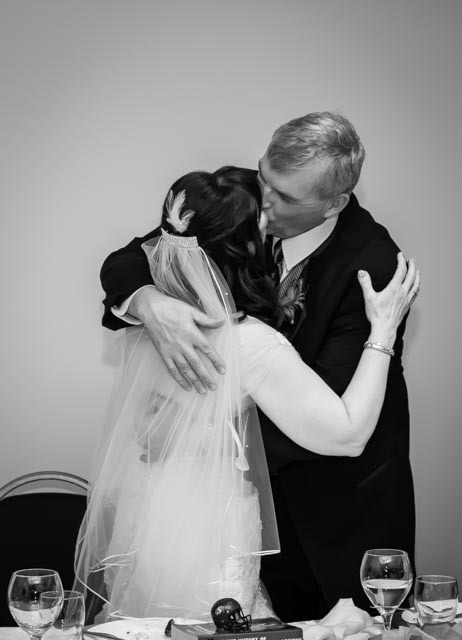 This entry was posted in 2014 Photo Project, Photos, post processing and tagged B&W, black and white, bride, groom, kiss, photography, photos, pictures, wedding. Bookmark the permalink.